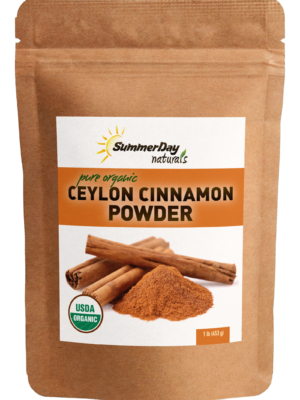 Summer Day Naturals’ Vanilla Bean Powder is a premium raw, pure and natural product ideal for cooking. Our Vanilla Bean Powder is purchased at Fair Trade prices from a family owned business in Indonesia and packaged in an FDA registered facility in USA. 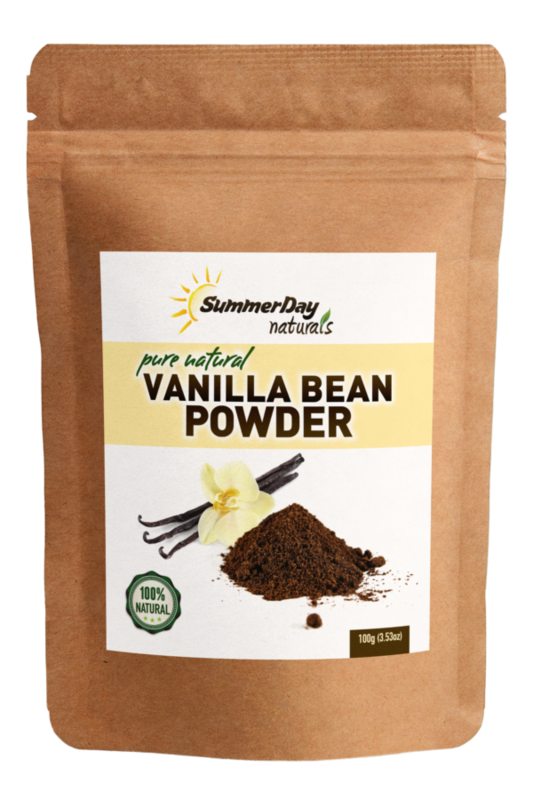 No chemical fertilizers are used to grow the vanilla and no post-extraction vanilla beans are used for the powder. 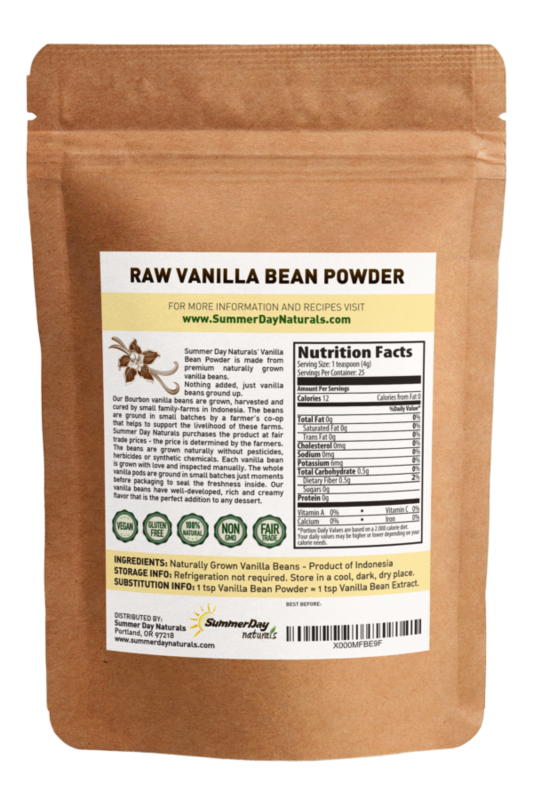 Our Ground Vanilla Bean is 100% naturally grown and raw high quality product. Naturally grown vanilla bean is more rare than you can think of. It grows only in a narrow area of the world, which makes the price high and pushes big companies to use synthetic vanilla. It’s estimated that only 5% of vanilla products are made of real, natural vanilla bean. Our product gives you the opportunity to cook your food with REAL vanilla. First, learn more about our Ground Vanilla Bean. Vanilla bean refers to the dried seed pod of the vanilla plant and is a tropical fruit of Vanilla planifolia, a species of vanilla orchid in genus Orchidadeae. Vanilla beans are high in compound vanillin that is responsible for the typical vanilla taste and scent. Our Ground Vanilla Bean is dark brown, sun-dried, pure and premium product. There are no post-extraction vanilla beans used. The most important is that our Ground Vanilla Bean is purchased at FAIR TRADE PRICES from a family owned business in Indonesia. This business keep alive so many tiny ones that produce small yearly amounts of vanilla beans and would not survive without them. We want to be sure that the farmers growing our product get fare price for their efforts and hard work. There are absolutely no chemical fertilizers used. 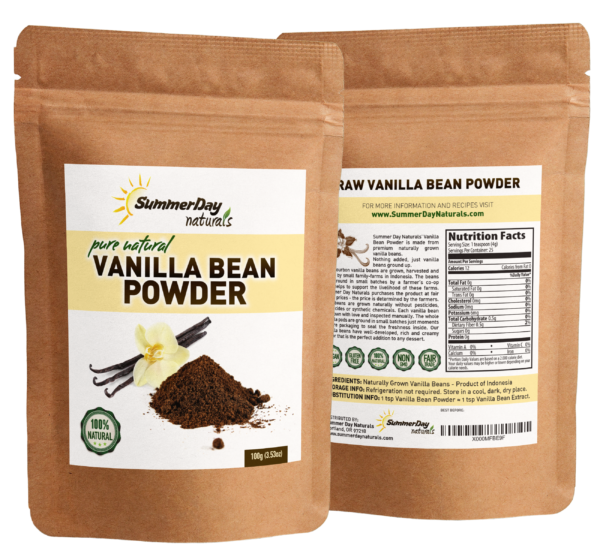 Our Vanilla Powder is packaged in an FDA registered packaging facility. There is no gluten cross-contamination. Our Vanilla Beans are raw, premium product. They’re ground moments before packaging to seal the freshness inside. Vanilla plants grow best in tropical forests that are being destroyed at an alarming rate. By purchasing natural vanilla that comes from those plantations in the rainforests, you help to preserve them. When farmers do well, they are interested in maintaining the forests as they are. Why is it important? Rain forests produce most of the oxygen that we breathe in every day. According to Rainforest Vanilla Conservation Association: “Carbon dioxide is the main greenhouse gas responsible for global warming. A one-acre vanilla plantation is estimated to annually absorb (sequester) the equivalent carbon dioxide emissions from burning 2,550 gallons of gasoline. Or for every one gallon of real vanilla ice-cream you consume, you are removing from the atmosphere the equivalent carbon dioxide emissions from burning approximately one gallon of gasoline.” Purchasing raw and natural vanilla bean rather than synthetic is also good from the ecological point of view. Vanilla Bean contains many trace minerals such like potassium, iron, manganese and copper. Potassium is important for cell and body fluids that help control blood pressure and hear rate.Iron is important for red blood cell production. Manganese and copper are co-factors for the antioxidant enzyme. According to USDA, vanilla bean is in the top 10 antioxidant foods. It has powerful antibacterial properties that help reduce skin infections and encourage wound healing. It can reduce bacteria that cause acne. Ancient Mayas believed that vanilla drink helps with sexual dysfunction. What is Ground Vanilla Bean Used For? Ground Vanilla Bean is most used for culinary purposes, it gives desserts and baking goods rich and creamy flavour. It can be used as a substitute for vanilla extract in many recipes. Vanilla is perfect to enrich the taste of coffee by adding a teaspoon to the ground coffee before brewing. It’s used a lot in DIY gifts and Christmas presents. It can be used in home-made bug repellents against mosquitoes. 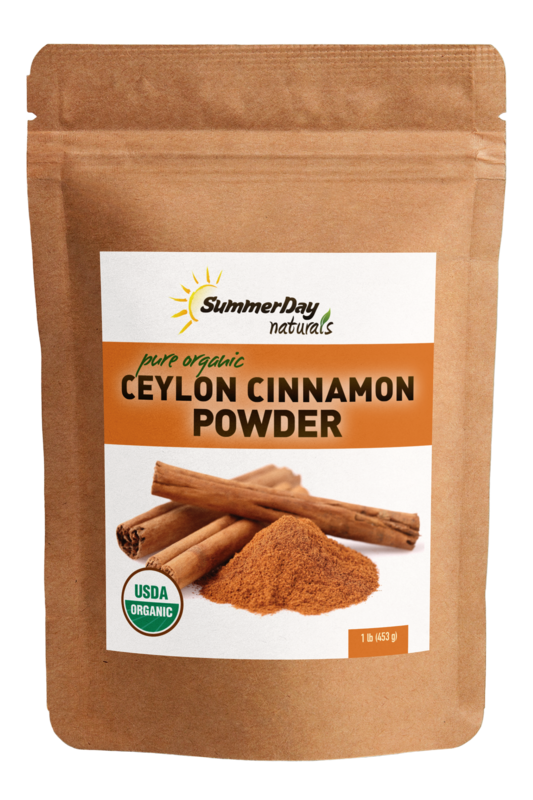 Often used in cosmetics due to its pleasant scent and antioxidant contents that help fight off free radicals. Vanilla possesses anti-inflammatory properties that help to soothe inflamed areas of the skin. Our Ground Vanilla Bean is 100% naturally grown and raw, purchased at fair trade prices. It’s packaged in an FDA registered facility in USA and it’s the highest quality product available.